With the advanced growth in technology, it's important to keep your child's imagination active and to enhance their creative abilities with innovative new learning tools. Recent research into human development has proven that parents truly are their children's first teachers. I have found a unique way to help you make learning easy and fun with your children! Each of my Music Audio Stories has excellent lessons which are taught in such a fun and simple way, children don’t even realize they are learning a lesson! When I began writing stories, my approach was to create them with an energy and enjoyment that would draw children into the story. I included educational elements naturally and this increased with the success of my Story Time. All of my stories have different themes. Whilst listening to my stories children learn about animals and insects, colours, numbers, flowers, and magic! I have stories about the Solar System and not littering! My audiobooks also introduce a variety of music genres, styles and instruments. Apart from enjoying my stories together with your child, you'll find many benefits listening to my audiobooks. They enhance mental well-being, build confidence and develop imagination. They teach your child the importance of friendship, cooperation, tolerance and team effort with everyone no matter how different they are. They inspire movement, problem-solving, build social skills and promote concentration. My audiobooks are great for school use and homeschooling. Music Audio Stories provide an entertaining tool for parents to not only test their child's listening abilities but also stimulate their productive senses, imagination and improve their visualization skills. My stories compliment Key Stage 1 and areas of the Early Years Foundation Stage too. Try one of my audiobooks and see how much fun and joy you'll have with your child! Simply download a story of your choice from the Shop and begin by listening to the story, then discuss the things you heard throughout the audiobook. Encourage your child to create a drawing of the story including the characters, location and anything else they heard. Then act out the scenes together and experience the enjoyment of our stories with your child. You can submit drawings for my Kids Corner too! All you need to do is make sure your child's first name is written on the front of the drawing with their age and the date on and then post them directly onto Facebook, Google+ or Tweet it @musicaudiostory. 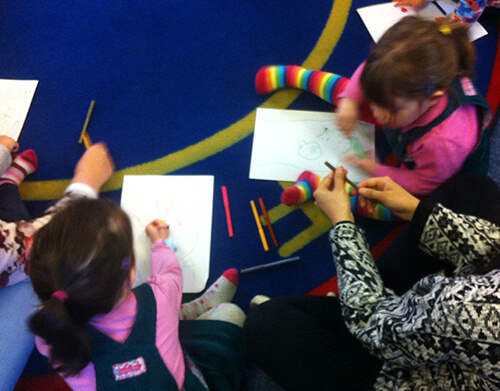 To see more drawings from nurseries, schools and community events visit the Facebook Gallery. Instil positive messages to your children helping them to build confidence and fulfill their dreams with my Music Audio Stories!